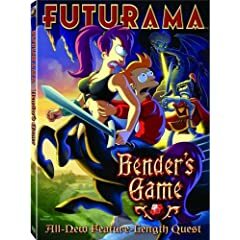 The Futurama franchise continues with the feature-length film, Bender's Game. In Get Smart, Steve Carell pulled off the almost impossible, creating a film that is superior to its original television show. Other feature films out this week include Blu-ray versions of Battle for The Planet of The Apes, Conquest of the Planet of The Apes, Escape from the Planet of The Apes, and the original Planet of the Apes (40th Anniversary Edition). A Blu-ray edition of the controversial Caligulais also available tomorrow exclusively from Amazon. (also available in a 5-DVD box set). The Budd Boetticher Box Set collects five westerns from the talented director (Tall T, Decision at Sundown, Buchanan Rides Alone, Ride Lonesome, Comanche Station), along with a documentary (A Man Can Do That) about the filmmaker. If you don't have any Battlestar Galactica on DVD, The Battlestar Galactica Franchise Collection (Season One | Season 2.0 | Season 2.5 | Season 3.0 | BSG Razor) makes an excellent starting point, and will surely be a popular holiday gift this year. Other notable television discs out tomorrow include the fourth season of Project Runway and the first season of Spin City, along with the complete Fraggle Rock and Get Smart series. Batman - The Complete Animated Series should make fans of the caped crusader happy. My wife's favorite holiday film, A Christmas Story, is available in a myriad of formats.